Washburn University (WU) is a co-educational, public institution of higher learning in Topeka, Kansas, United States. It offers undergraduate and graduate programs, as well as professional programs in law and business. Washburn has 550 faculty members, who teach more than 6,100 undergraduate students and nearly 800 graduate students. The university's assets include a $158 million endowment. Washburn University was established in February 1865 as Lincoln College by a charter issued by the State of Kansas and the General Association of Congregational Ministers and Churches of Kansas on land donated by abolitionist John Ritchie. The school was renamed Washburn College in 1868 after Ichabod Washburn pledged $25,000 to the school. Washburn was a church deacon, abolitionist and industrialist who resided in Worcester, Massachusetts. 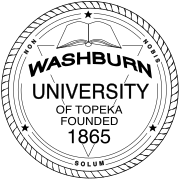 Washburn College in Topeka, Kansas, adopted a variation of the Washbourne Arms, using creative license to alter the tinctures (colors), to its school's colors, and used it as its own logo. Since becoming "Washburn University", the school has abandoned the Washburn Arms logo. They're now using a stylized "W" in its place. The school mascot "The Ichabods", is still in use. Washburn University’s mascot, The Ichabods, honors the school’s early benefactor, Ichabod Washburn. The original design of the studious-looking, tailcoat-clad figure was created in 1938 by Bradbury Thompson (B.A. ‘34), who became an internationally acclaimed graphic artist. In 1913 the medical department of Washburn College closed. Previously the Kansas Medical School had become infamous on December 10, 1895, when it was discovered that some of the bodies used for anatomical study had been stolen from local cemeteries. As the news was being printed (eventually across the country) the governor called out state troops to protect the school in fear of a riot. Three of the doctors, including the Dean of the school, and a janitor/student from the school were arrested as well as one man not a member of the school. Charges against the doctors were discharged, the janitor was convicted but had his conviction reversed on appeal and the final man was convicted but later pardoned. During World War II, Washburn Municipal University was one of 131 colleges and universities nationally that took part in the V-12 Navy College Training Program which offered students a path to a Navy commission. Formerly a municipal university, the university's primary funding was moved from city property tax to county sales tax sources in 1999, with the school retaining status as a municipal subdivision of the state. Washburn is governed by its own nine-member Board of Regents. The president of Washburn University is Jerry Farley, who has served as president since 1997 and taken an active approach in improving academics and student life. Washburn University is governed by a nine-member Board of Regents. Three, who must be residents of the state of Kansas, are appointed by the Governor. Three residents of the City of Topeka, one from each of the state senatorial districts, are appointed by the Mayor. One is the Mayor or a member of the governing body of the city designated by the Mayor. The Shawnee County Commission appoints one member, who must be a resident of Shawnee County but not of the City of Topeka. The Kansas Board of Regents annually selects one of its members to serve on the Washburn Board. Members of the Board (with the exception of the Kansas Board of Regents' appointee) serve staggered four-year terms. These persons have served as presidents or interim presidents of Washburn College (1869–1940), Washburn Municipal University of Topeka (1941–1952), and Washburn University (1952–present). Formed in 1903 the Washburn School of Law was one of the first in the country to have a legal clinic where students are able to actively practice the legal profession. Today, it is in the minority of law schools to employ a full-time faculty for its law clinic. The Washburn School of Law had the highest pass rate of the Kansas State Bar Exam of any law school in the state of Kansas. The Washburn Law Library houses over 380,000 volumes and is the largest in the state. Notable alumni include Bob Dole, Roy Wilford Riegle, Dennis Moore, Kim Phillips, Bill Kurtis and Fred Phelps. The main buildings of Washburn University are all dedicated to someone or are an important part of Washburn's history. The athletic teams are known as the Ichabods. Prior to the 2013–14 season, the women's athletic teams were known as the "Lady Blues". On May 24, 2013, President Farley announced that all athletic teams will be known as the Ichabods for the first time in history. Washburn is a member of the Mid-America Intercollegiate Athletics Association and the National Collegiate Athletic Association Division II. The current athletics director is Loren Ferré. "The name of Washburn shall never fall, Midst the great and small, she's the best of all; For her fair name, Then, we'll win the game, And add another victor's crown So then, we'll smash, crash against the line "As in Auld Lang Syne," Crush them down, So Cheer now, yes, cheer, cheer, cheer Just for Washburn and her team!" Greek Life at Washburn University has existed since 1909. Currently, three of the four Interfraternity Council and the three Panhellenic Council organizations are housed on or near campus. KTWU, a non-commercial, public television station authorized by the Federal Communications Commission, Washington, D.C. and licensed to Washburn University. KTWU, the first public television station in Kansas, commenced telecasting October 21, 1965. Mulvane Art Museum opened in 1924. The museum's permanent collection, though international in scope, emphasizes the work of artists of Kansas and the Midwest. Crane Observatory houses an 1898 Warner & Swasey refracting telescope. ^ Martha Imparato. "Washburn University History" (PDF). Retrieved September 9, 2015. ^ Washburn University Brand Guidelines: A Guide To The Washburn University Identity for Vendors (PDF). June 19, 2017. Retrieved March 16, 2018. ^ a b c d e "History". washburn.edu. ^ "Stories of the 1966 Topeka Tornado". washburn.edu. ^ "Meet the President". washburn.edu. ^ "Washburn Athletics". Washburn Athletics. "Washburn College" . Collier's New Encyclopedia. 1921. Delano Eugene Lewis (born November 12, 1938) is an American attorney, businessman and diplomat. He was the United States Ambassador to South Africa from 1999 to 2001, and previously held leadership roles at the Peace Corps and National Public Radio. He is the father of actor Phill Lewis. Harold H. Chase (March 31, 1912 – October 24, 1976) was an American politician. He was Lieutenant Governor of Kansas from 1961 to 1965. A lawyer, he was educated at Phillips University in Oklahoma, Washburn University, and Kansas Wesleyan University. In June 2015, Schemmel competed in the Race Across America, a 3,000-mile bicycle race from Oceanside, California, to Annapolis, Maryland, as part of a two-person relay team. He and Brad Cooper won the two-person relay division, finishing in 7 days, 14 hours. In 2016, he was a member of a four-person relay that set the a record for the "Colorado Crossing," a 468-mile cycling race from the Utah/Colorado border to the Kansas/Colorado border. In 2017, he set the solo age group record in the same event, finishing in 33 hours, 3 minutes, just 54 minutes from the all-time speed record for the event, set in 1992. Schemmel has also completed nine triathlons and three marathons. He is the younger brother of Jeff Schemmel, a former college track and field All-American, long-time college athletic administrator and former athletic director at San Diego State. They are natives of Madison, SD. James Charles Slattery (born August 4, 1948) is an American politician. He served in the U.S. House of Representatives from 1983 to 1995 representing Kansas's 2nd congressional district as a Democrat, was the Democratic nominee for governor in 1994 and was the Democratic candidate for U.S. Senator in 2008. Joan Finney (February 12, 1925 – July 28, 2001) was an American politician who served as the 42nd Governor of Kansas from 1991 to 1995, the first woman to hold that office. She had previously served four terms as the Kansas State Treasurer from 1975 to 1991, the first woman to hold that office as well. KTWU, virtual and VHF digital channel 11, is a Public Broadcasting Service (PBS) member television station licensed to Topeka, Kansas, United States. The station is owned by Washburn University. KTWU's studios are located on the western edge of the Washburn University campus at 19th Street and Jewell Avenue (with a College Avenue mailing address) in central Topeka, and its transmitter is located on Wanamaker Road (south of the Kansas River) on the city's northwest side. It also operates a low-power translator serving portions of southeastern Kansas, K30AL-D (channel 30) in Iola, whose transmitter is located near Moran. On cable, KTWU is available in the Topeka area on Cox Communications cable channel 8 in standard definition and digital channel 2008 in high definition, and on AT&T U-verse channel 11 (SD) and 1011 in (HD). The station is also available throughout eastern Kansas on many cable and satellite providers. It is also carried on many cable systems on the Kansas side of the Kansas City metropolitan area, giving viewers west of the Missouri River a second choice for PBS programming alongside KCPT. Michelle White "Miki" Bowman (born May 25, 1971) is an American attorney and a Governor on the Federal Reserve's board. She is the first person to fill the community bank seat on the board, a seat created by a 2015 law.Previously, Bowman was the Kansas banking commissioner, from January 2017 through November 2018. She also held senior staff positions at the Federal Emergency Management Agency and Department of Homeland Security during the George W. Bush administration. Nancy Louise Moritz (born March 3, 1960) is a United States Circuit Judge of the United States Court of Appeals for the Tenth Circuit and former justice on the Kansas Supreme Court. There's Know Place Like Home is Kansas' fifth live album. It was released as a double CD and also on DVD on October 13, 2009 and Blu-ray on November 23, 2009. The DVD charted at No. 5 on the Billboard Music DVD chart the week of its release, Kansas's only appearance on that chart.There's Know Place Like Home is a recording of a concert that took place on February 7, 2009 in Topeka, Kansas at Washburn University (which several members of Kansas attended) along with the Washburn University Symphony Orchestra. The concert featured several orchestral arrangements by Larry Baird of Kansas songs (Baird also served as conductor for this concert) - arrangements the band has been playing with symphony orchestras around the US since the release of 1998's Always Never the Same which featured the London Symphony Orchestra accompanying the band. The cover features the old man depicted on the cover of Leftoverture and the papers around him with a black background. A special edition bundle has been released, containing the DVD and two CDs of the concert. The Washburn Ichabods are the athletic teams that represent Washburn University in Topeka, Kansas. Named for Ichabod Washburn, the Ichabods are a member of the NCAA Division II and the Mid-America Intercollegiate Athletics Association. The Washburn Ichabods football program represents Washburn University in college football. They participate in Division II sports within the NCAA. The team plays their home games in Yager Stadium at Moore Bowl, located on the Washburn University campus in Topeka, Kansas. Wasburn's football program dates back to 1891. The Ichabods claimed one MIAA conference championship in 2005, but 12 conference championships all together. Under Craig Schurig, the Ichabods have appeared in the Division II playoffs in 2004, 2005, 2007, and 2011. The Washburn Institute of Technology (colloquially known as WU Tech) is an American institute of technology located in Topeka, Kansas. It houses a variety of programs including nursing, auto technology and culinary arts. It is administered under Washburn University. The Washburn University School of Law, commonly referred to as Washburn Law, is a public law school located on the main campus of Washburn University in Topeka, Kansas. Washburn Law was founded in 1903. William Robert Roy (February 23, 1926 – May 26, 2014), also known as Bill Roy, was a United States Representative from Kansas, a physician, and a columnist for The Topeka Capital-Journal. Yager Stadium at Moore Bowl is a sport stadium in Topeka, Kansas. The facility is primarily used by Washburn University for college football and men's and women's soccer teams. The stadium currently hosts the Kansas State High School Activities Association Class 6A state championship game. Previously just called the Moore Bowl, the stadium was re-dedicated in 2002 and named for former Washburn player Gary Yager at the request of an anonymous donor.